At the Satori School in Tucson, Arizona, Program Director Misty Walker was insistent on making changes in their program beginning with the program policies. “It was hard to change routines and get a new routine in order,” she recollects. Walker initiated this change by purchasing more materials, adjusting schedules and changing children’s classroom jobs. For family-style dining, children created placemats to be used during mealtime so they had a designated area at the table. 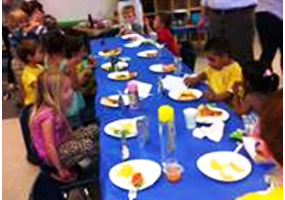 During mealtime, children pass out placemats, snacks and drinks, while using kind words and manners. The program has even included families in the new changes. Parents are asked to send a “snack pack” to assist in family-style dining during snack time. Additionally, parents take turns bringing in 1% milk and occasionally join children during mealtimes. “If I could describe our change in one word it would be ‘enlightening.’ I have learned so many things. I can now assess the children as they achieve developmental milestones, assist the children in learning body control and sportsmanship, and most importantly share laughs and stories with children during mealtime,” says Walker. A registered nurse at the Jewish Community Center Early Care and Education in Maryland helps teachers see that family-style dining with little ones is possible. Time in the kitchen with preschoolers may take a little flexibility and prep work but it can be a rewarding culinary adventure.